Introduction: Ham and Petersham are a neighbouring pair of ancient villages on the south bank of the river Thames which,to a remarkable extent, have managed to preserve their village status and historical character in spite of the developmental pressures of the 19th and 20th centuries. The aim of this book is to celebrate what makes the two villages so special and of such interest by bringing together a selection of the available relevant historical material both in words and in pictures. It pays particular attention to the buildings and the people who lived and worked in them, but does not aim to be comprehensive; often only an outline can be given if the account is to remain within reasonable bounds. The village of Petersham was recorded in the Domesday Book of 1086 as Patricesham, on land owned by Chertsey Abbey. The survey mentions a church, which would have been St Peter’s, and a fishery ‘worth 1,000 eels and 1,000 lampreys’. It is thought the village of Ham derived its name from Hamme, an old English word meaning meadowland in a bend of a river. It was a hamlet of Kingston, and until 1897 was known as Ham with Hatch. 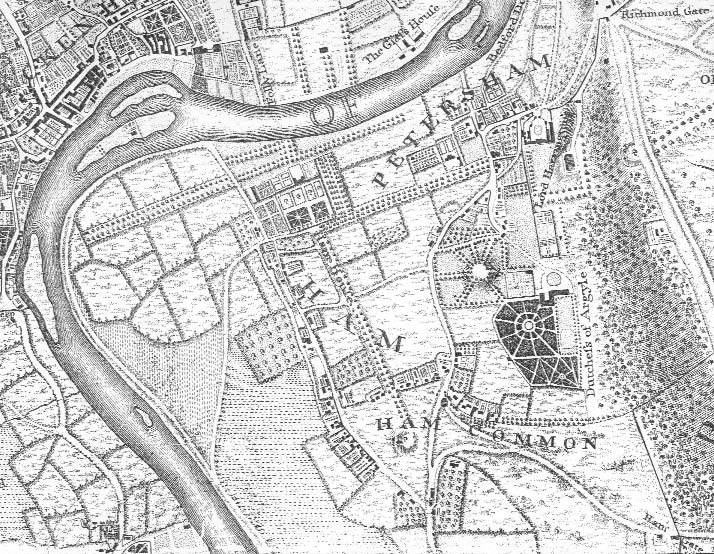 Originally, Ham was the village along Ham Street and the land to the west of it in the river bend, together with a large part of what is now Richmond Park stretching east as far as the Robin Hood Gate. Hatch was a small area on the north side of Ham Common (the open part of which was at one time called Hatch Green). Hatch was a part of the Manor of Kingston Canbury which had belonged to Merton Priory, and did not come into the same ownership as Ham until the Canbury manor was bought by Wilbraham Tollemache, 6th Earl of Dysart, in the late 18th century. The manor of Ham, originally part of Kingston, was purchased by King Henry V in 1415. At the same time he acquired Petersham manor from Chertsey Abbey in exchange for lands elsewhere. In the 15th and 16th centuries Ham and Petersham were royal manors leased to the Cole family (see page 78). In the 17th century the lease passed to William Murray, 1st Earl of Dysart, of Ham House, and in 1671 the Duke of Lauderdale, who had married William’s daughter Elizabeth Murray as her second husband, secured the lands of Ham and Petersham in freehold for the Lord of the Manor from the Crown.